1 This product is in maintenance (sorry, no new sales). Why? 3 What's it used for? This product is in maintenance (sorry, no new sales). Why? There are more recent versions of Revit and Microsoft Project. These new versions have different requirements that are, unfortunately, no longer supported. 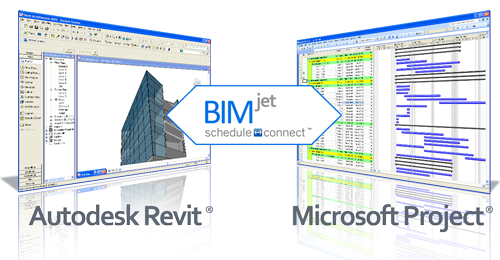 A plug-in for Autodesk Revit 2009 to connect your Revit BIM model to a Microsoft Project 2007 schedule. Schedule all relevant building components directly from your Revit model. Enable 4D (construction / assembly visualization), Create activity schedules that are useful and relevant. No need to make two schedules (one to meet the spec and one to actually use). CPM (Critical Path Method) schedules that are effective. Contractors and Architects. If you have one or more seats of Revit and Microsoft Project, this is for you! Capitalize on your investment in these tools without the added burden of learning a new tool. Synchronize Microsoft Project and Autodesk Revit with a single click. Freely schedule Revit elements in Microsoft Project, then update the Revit model with your scheduled changes while simultaneously updating your schedule. Works out-of-the-box but can also be rapidly tuned to your specific scheduling needs. Schedule Connect automatically installs and configures itself to run as a Revit plug-in. There is no need to update and configure shared parameters and categories within Revit. See more help about installing BIM Jet updater here. Simple software activation: After installing the software will activate upon first use. Contact Us to request a trial and download. *Schedule Connector requires Autodesk Revit (Architecture, MEP, or Structure) and Microsoft Project to be installed on the same system.